Policy & Politics will be at the 2019 PSA Conference! Do your plans for the Easter vacations include a trip to Nottingham for the 2019 Annual International Conference of the Political Studies Association? And are you interested in meeting the editorial team of Policy & Politics to discuss your work? If so, read on as this blog post is for you! We’re really excited to be attending the full three days of the conference, and even more excited to hear more about the great research that’s currently being conducted in our academic community. 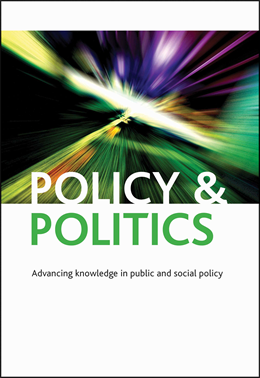 Throughout the conference, Policy Press – our publisher – will be based in the exhibition area and will be happy to talk to authors, reviewers, or budding editors to be. And on Tuesday 16 April, Policy & Politics will be taking part in the ‘meet the editors’ publishing roundtable, which is being sponsored by the PSA Early Career Network. If you’re new to academic publishing, this is a great opportunity to hear from editors from a number of journals, to find out more about the ‘mechanics’ of publishing, and to ask any questions that you may have. The roundtable will be held in Lecture Theatre 2, 09:30-10:30. Read the latest issue of Policy & Politics online here.